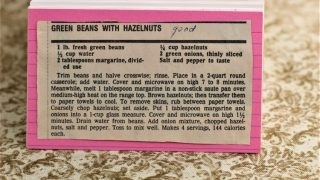 Front of the recipe card for Green Beans With Hazelnuts. 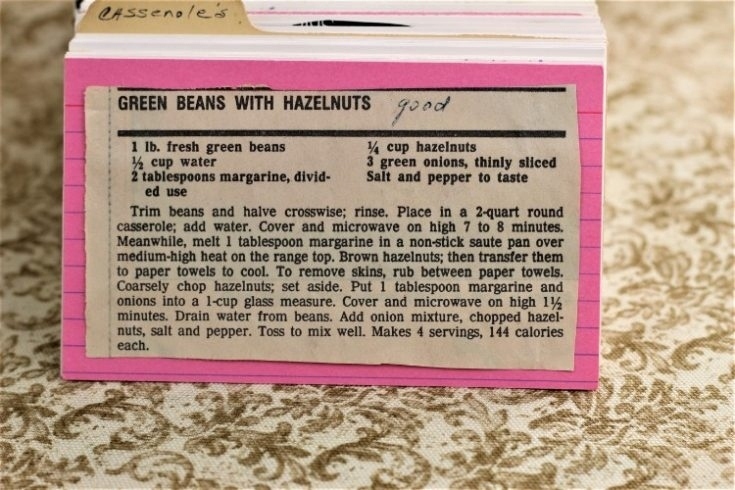 There are lots of fun recipes to read in the box this recipe for Green Beans With Hazelnuts was with. Use the links below to view other recipes similar to this Green Beans With Hazelnuts recipe. If you make this Green Beans With Hazelnuts recipe, please share your photos and comments below! Trim beans and halfe crosswise; rinse. Place in a 2-quart round casserole; add water. Cover and microwave on high 7 to 8 minutes. Meanwhile, melt 1 tablespoon margarine in a non-stick saute pan over medium-high heat on the range top. Brown hazelnuts; then transfer them to paper towels to cool. To remove skins, rub between paper towels. Coarsely chop hazelnuts; set aside. Put 1 tablespoon margarine and onions into a 1-cup glass measure. Cover and microwave on high 1½ minutes. Drain water from beans. Add onion mixture, chopped hazelnuts, salt and pepper.